Martellus Bennett has a unique sense of humor that some Patriots fans may not be too familiar with. If you're in that group, you're going to learn about it real quick. Bennett recently referred to himself as a chameleon in terms of fitting in. Referencing Dr. Seuss and Oscar Wilde in the same quote... I like this guy. With Rob Gronkowski nursing an undisclosed injury that isn't seen as serious, Bennett has been getting a lot of reps with Tom Brady. While minicamps are generally lighter in nature than a full-on practice in training camp, Bennett said he's enjoying the time he gets to spend with Brady as the two build chemistry. 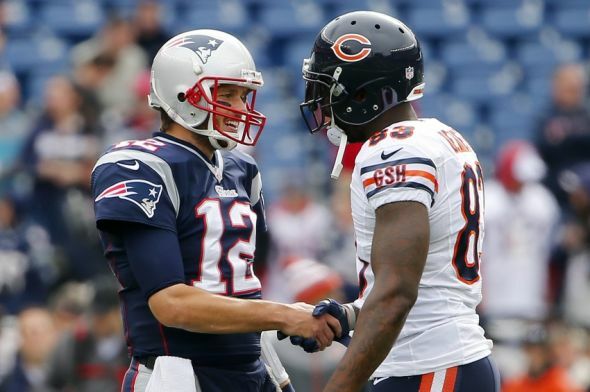 “Really just trying to get on the same page with Tom and everybody else. How he wants me to run routes, the way he throws the ball, timing everything out. Some things I do differently than other players—lots of communication, making sure I can do my job. With Bennett in the fold, the Patriots hope to once again employ a dual-tight end threat in their offense. That experiment with Scott Chandler failed last year, but Bennett is a much better player across the board. His personality should fit in well in New England given that he's saying and doing all the right things. Bennett has been known to be a bit of a head case, but the Patriots are usually pretty good at getting guys like that to leave their egos somewhere else.